Sixteen years ago I had a pda. Not one of those nifty Palm devices or expensive Psion's. No, a regular organizer; a little electronic device with a whopping 128KB of storage which you could fold shut like a litte book. Opened, it provided a nice little qwerty-keyboard and about 4 lines of lcd-display (the black/white kind). Communication was done by using an infrared port with a special cable or a special cable with some sort of jackplug. Both were rather expensive and cumbersome, so I didn't have those. Standalone as it was, I carried it everywhere. It was my agenda, notebook, addressbook (family, friends, classmates, everyone I deemed important were represented in it). It was a glorious little thing. It made me the Nerd. People weren't used to lugging electronics around. Cellphones were still rather exotic one-line-display affairs and organizers made a teenager stand out among his pears. Not really in a good way, but I was used to that. I brought my pda to class anyway. At home I had just bought my first PC-class computer. This might be surprising, but I always used my dad's computers, so spending my teenage pocket money on big expensive beige electronics was not needed. It was great to finally have one of my own though, so I could keep thinkering away while my dad did his taxes or own thinkering on his own machine. The advent of internet helped with the thinkering as there was quite a lot of new things to explore. I remember the dial-up sessions to gather all the dependencies for xmms on RedHat 5.2 in 1998; I just wanted to play my tiny collection of mp3's, but it took me the better part of an afternoon and quite a bit of phone minutes to finally satisfy the installer. Package managers have come a long way since, thankfully. This was my main place for hacking on projects. I teached myself programming and a lot of other computer skills first on my dad's computers, then on that speedy little AMD K6 3DNow 350MHz, sitting at my desk. Quite nice to get home to after school. Fast forward a decade, past using Sony Clie PalmOS-running devices used for everything including reading ebooks to the modern class of smartphones. Call me a hipster if I was underwhelmed by the Blackberries (I was used to the highres touchscreen of my Clie TH-55), apart from their expensive allways-on internet. Same with iPhone and first gen Android. My Sony M600i also had a colourful touchscreen and very usable hardware qwerty-keyboard to boot. Those latest generation smartphones peeked my interest though, as they finally seemed capable of replacing my modular system of cellphone/pda/hardware keyboard. At the time I was rocking that M600i, the still quite nifty Nokia N810 and the iGo foldable bluetooth keyboard. It made for a combination that was modular, mobile (e.g., pocketable) and usable for various types of communication while on the go. I could irc on the train by tethering my N810 over bluetooth using the M600i's gprs, typing away on its own keyboard or the external iGo one. Same with hacking on my projects, but it was just barely usable as the lag and tiny input methods were far from comfortable. Programming still took place mostly on desktop pc's, be it my own workstation, one of the many at the university (though they were way often all in use already) or my laptop. I got a laptop soon after getting frustrated with the crowded computer labs and after getting together enough money, so from 2001 on I rocked a mobile place to do my thinkering. After a few years I got a wifi card with the wifi pilot on campus and a few years after that I could tether with my phones. Still, most development was done offline or on a machine always connected to the intertubes. 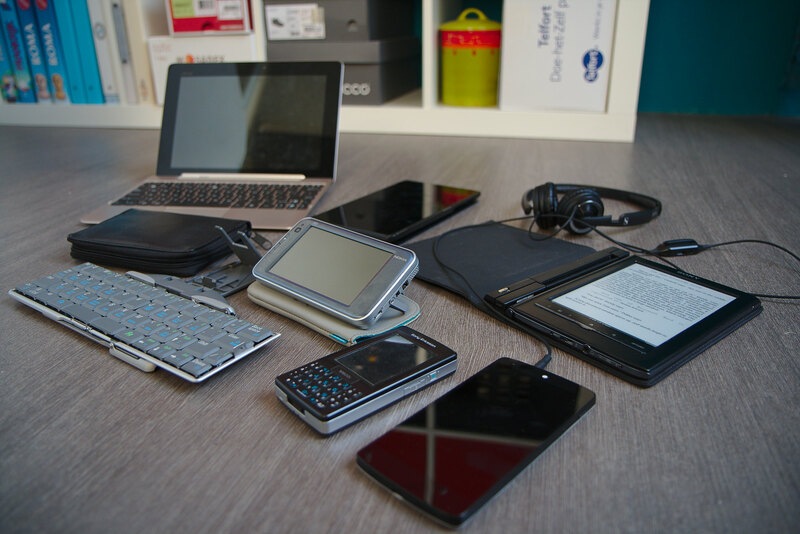 Half a decade later still, we've entered the era of mobile computing in full force. Noone will call you a nerd if you whip out your big-screen supercomputer from your pocket and start watching HD movies of kittens on it while you kill some time in the train or waiting in a queue. Better even, people look weirdly at a person using a dumbphone to call or text their peers with. Convergence finally took over in my set of gadgets, with my smartphone doing 'it' all. I have a tablet for when it's just more convenient to have a bigger screen (watching series, reading articles, browsing and playing games for example), but I can do all the same on my Nexus 5. Even programming and such is facilitated by apps like DroidEdit with built-in git support, syntax highlighting and all the other goodies a developer expects and loves. 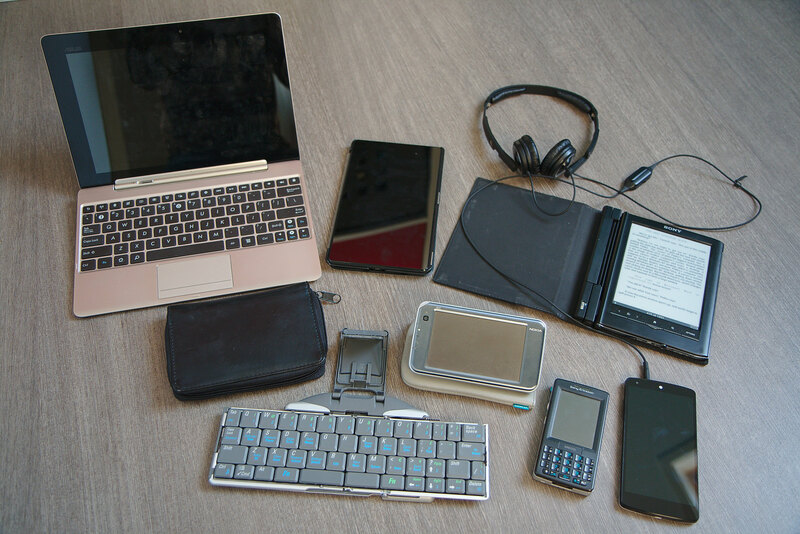 In a recent blogpost, Revisiting Convergence, by a longtime netfriend of mine, he talked about the way he used his devices, especially trying to do everything on a single device (in his case the Asus tf700 tablet). The convergence we see in the mobile industry however is not capable of supporting creators the way it caters to consumers so much. Both my friend and I found that trying to do hacking on truly mobile devices (non-laptop) is just too inconvenient to bother with. The form factor might not be quite right, the input methods too tiny or the device is just not powerful enough. I tried it with my own keyboard-tablet combination - the Asus tf201 (aka Transformer Prime) - and later with the 7" Nexus 7 2013 edition with the trusty old iGo keyboard. The former has its problems with a super slow storage and the latter is a bit unstable to use on my lap in a moving train. Reading a book on my ereader is a much more enjoyable passtime. Getting a cheap, light laptop or Chromebook crossed my mind, but then I remembered that I already tried with my Prime and didn't use it much anyway. So, both of us are back on our powerful laptops for actually getting work done. An editor is often not enough for my projects, so I often require compilers, interpretors, web daemons and more, which are all running fine on my portable workstation (or on virtual machines running on it), but are quite hard to use on the sandboxed environments of mobile devices. My netfriend is switching to a dumbphone (feature phone) and uses a Nokia n810 for irc and his notes, a Kindle for reading and his work iPad as backup. I'm doing something similar already, but I will most likely not switch to a feature phone. My Nexus 5 is still my trusty companion for everything mobile web (from websites, articles in Pocket, social media and of course email and Google Hangouts for communication), while I use my tablet mostly for consuming media, reading articles with Pocket and notetaking with the aforementioned DroidEdit into a git repository with text files I also use on my laptops. I don't think I will (ever?) go back to a dumbphone, as I don't use my phone for voice communication all that much. The convenience of internet in my pocket is great enough to stick with a decent smartphone. However, I'm not glued to it; on my daily commute I generally read books on my ereader, while listening music on my phone which is tucked into a pocket. Notifications are pushed to my Pebble smartwatch, so I know when something important happens in a glance. Not many important things happen, so I can dismiss quite a bit by pushing a button on my wrist while staying emerged in my book. While quite qualified to do some hacking on the go, my Asus Prime actually is largely unused; it's a convenient irc terminal now and then and also acts quite nicely as instant webcam by virtue of IP Webcam. My continuous experiment goes on, so my set of gadgets will change, but I think the configuration will largely remain like it is today. Anything more involved than changing a few lines in a text or source file will have me whipping out my laptop, even in the train. Don't have it with me? I'll make a note and do it later, in the meanwhile continuing reading longform (books or articles). Creating continues to be the domain of 'real' computers.